A compact combined extractor fan with an integral halogen light. Designed for installation in galleys, showers and toilets, ideal for marine and other leisure applications. Long life computer motor which will run continuously, only 2.8 Watts. 12 Volt DC motor & 24 Volt DC motors also available. Ignition protected. 50,000 hours operating life expectancy. 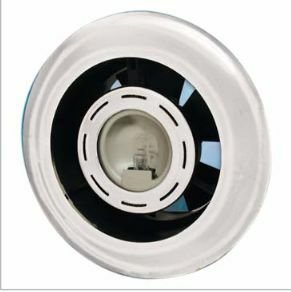 The fan and light may be switched on together or used independently. Available in White and Chrome finishes. Quiet and efficient, the Extract-A-Lite has an extraction rate of 64m3/hr or 18 litres per second and only 43 dB(A).